As I reflect on Thanksgiving this year, I know I am grateful to be back at the Paul M. Hebert Law Center. Susan and I have been here for some five months, and it has been a rewarding and sometimes challenging time. But I can honestly say we have loved every minute. As I said to you in my first message back in July, it feels like coming home. I have visited with alumni and friends throughout the state and country and I am thankful for the warm welcome and strong sense of community that I have felt among our graduates and supporters. It has been great to get reacquainted with former students and friends and to make so many new acquaintances that I know will result in lasting friendships. On the home front, I knew and have seen that our faculty and staff are among the best at what they do. I cannot thank them enough for supporting me during this first few months. Our students are intellectually curious, hard-working, and committed to the public good. I cannot wait to be back in the class room next semester teaching Maritime Personal Injury and Torts. Our first-year class was 199 strong and, once again, our graduates placed 1st in bar exam passage rates among the state’s law schools. We’ve had a great first semester. I am also very grateful that so many law firms, businesses, and government and nonprofit organizations continue to employ our students, as evidenced by the recent positive report on employment. Some 91 percent of the Class of 2015 was employed within 10 months of graduation (95% of the class reporting). Thank you for your commitment to the career success of our young lawyers. 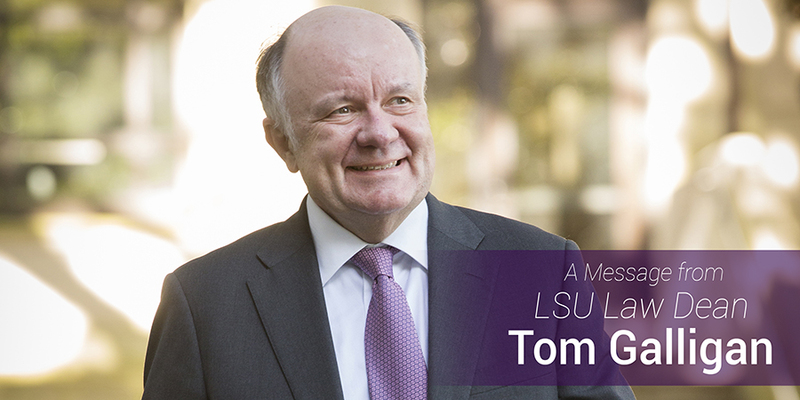 LSU is a great law school, and we shall work together to make the school even better than it is today. Best wishes for a wonderful Thanksgiving.